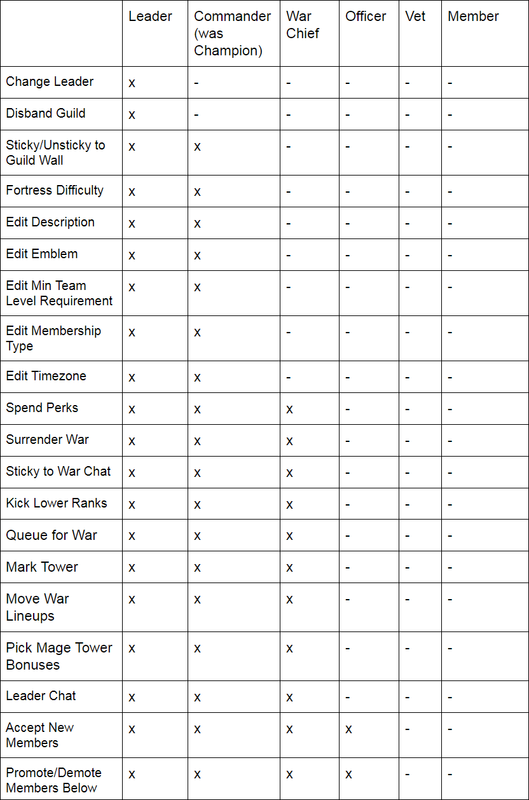 See this image for an easy (but a little outdated) overview, posted by Ironangel. Leader: Almighty, can change the leader. The leader is the one who would be invited to the Discord chat with PerBlue if the guild is strong enough, but can let someone else be the ‘representative’. Commanders: Can do almost everything the leader can, but can’t promote warchiefs or demote commanders. Can post and pin messages to the guild wall. Can delete messages in guild chats. 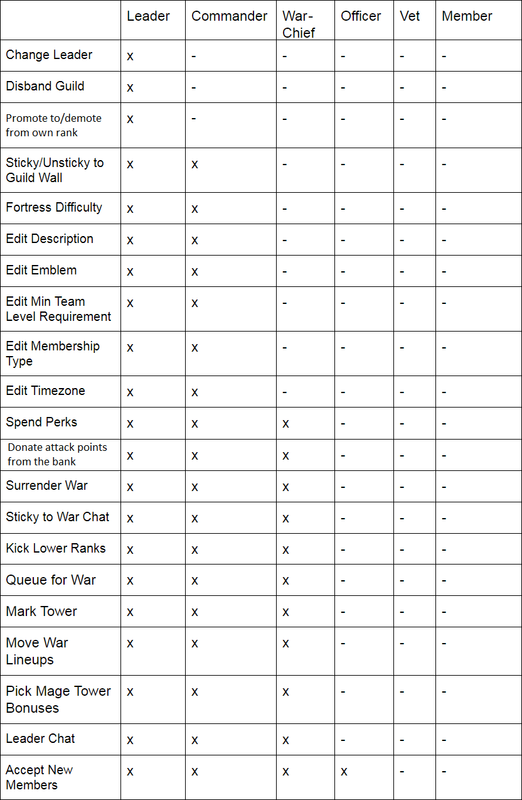 Warchiefs: Can do everything war-related, such as reordering lineups for different towers, queuing, selecting mage tower buffs, surrendering war, and using points from the AP bank. They can also monitor the war chat by pinning or deleting messages. They can also promote veterans, demote officers, and kick lower ranks. Officers: Can demote/promote veterans and members. Officers can not promote veterans to officers but can accept new members. Veterans: Get some credit, but no power. Normal members. Can do nothing special. Can only place their own lineups in war. All ranks also have the same powers as the ranks below them, meaning that a promotion always is an upgrade. Edit: heb je het niet gecheckt? of ging je er gewoon vanuit? I just edited in some stuff, and now everything should be correct. Here’s an updated version of the image Ironangel posted in the 1.3 patch notes. Really old thread , but apart from portal lords missing, pretty much still relevant.